Valance, maker unknown, late 19th century. Satin stitch and bullion knot thread-work on velvet. Caroline Simpson Library & Research Collection, Sydney Living Museums. Photo (c) Jamie North. A valance is a piece of drapery used to decorate interior features such as windows, beds, shelves and mantels. The practice of draping furnishings was highly fashionable in the late 19th century and valances could be used on their own or incorporated into elaborate arrangements. Instructional manuals such as The Practical Upholsterer were popular amongst amateurs and professionals alike, for direction on the appropriate construction and application of draperies for every situation. Example of fireplace drapery. F.T. Hodgson, The practical upholsterer, Industrial Publication Company, New York, 1891. Caroline Simpson Library & Research Collection,Sydney Living Museums. Berlin wool work is a style of embroidery using wool yarn on canvas. Counted stitch patterns were first printed in Berlin, Germany in the early 19th century and circulated to Britain, the United States and Australia. Being inexpensive to produce, these patterns were readily taken up by an emerging class of women with leisure time to dedicate to needlework. Needlework pattern in Berlin wool work for slippers from 'The Englishwoman's domestic magazine', vols III-IV, 1861-1862. Caroline Simpson Library & Research Collection, Sydney Living Museums. 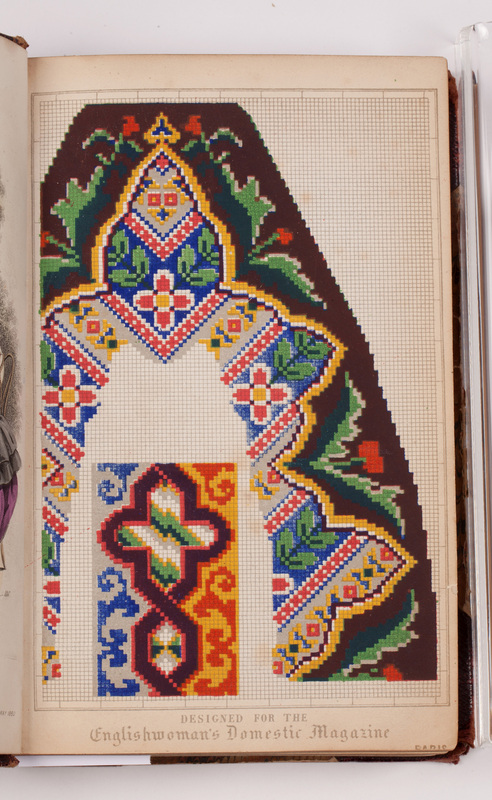 From the 1850s the popularity of Berlin work grew exponentially, largely due to the advent of publications such as The Englishwoman's Domestic Magazine, which included patterns for the embellishment of myriad items including cushions, firescreens, night caps and slippers. The creation of these practical and decorative objects added a sense of comfort to family life and came to embody Victorian notions of ‘home’ and the role of women in the domestic sphere. 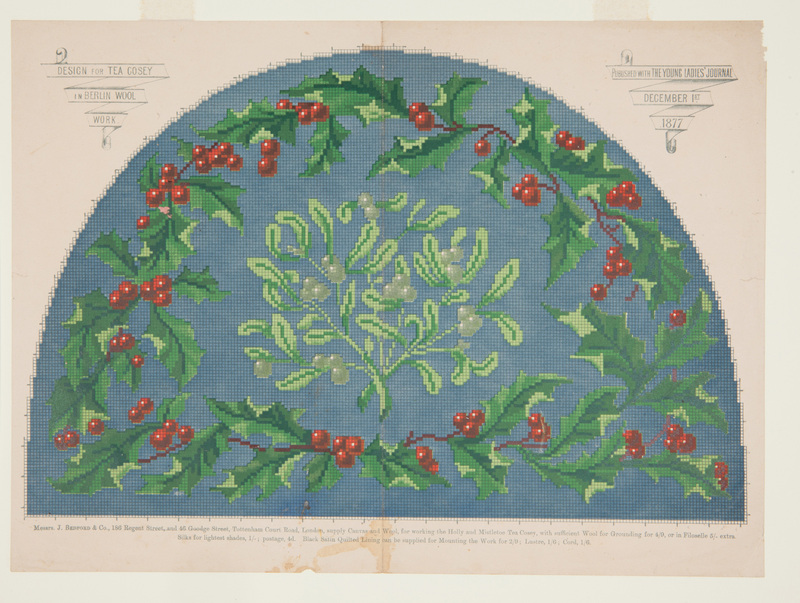 Needlework pattern for a tea cosey in Berlin wool work, from the "Young Ladies' Journal", 1 December 1877. Caroline Simpson Library & Research Collection, Sydney Living Museums. Needlework pattern in Berlin wool work from 'The Englishwoman's domestic magazine: an illustrated journal containing practical information, instruction and amusement', New Series Vol. VIII- IX, 1864. 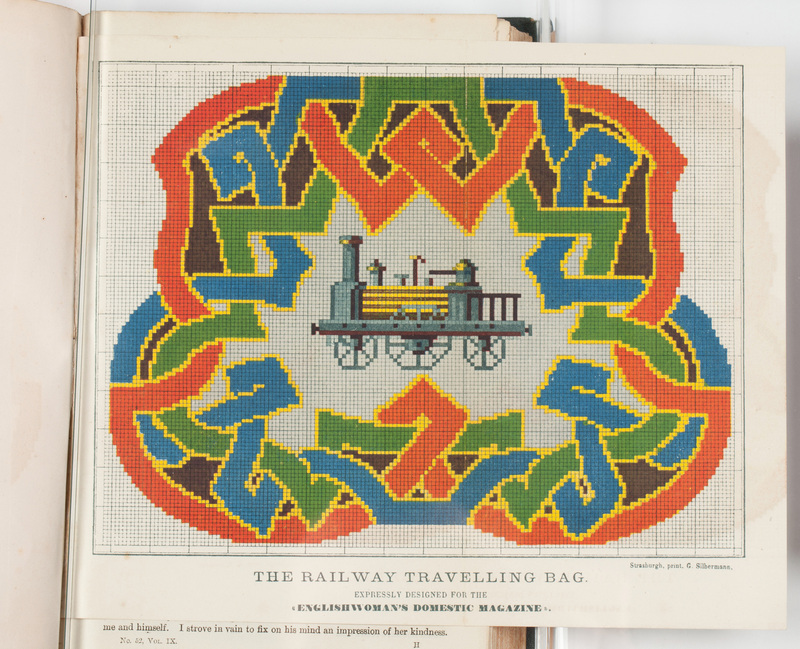 Needlework pattern in Berlin wool work for a travelling bag from 'The Englishwoman's domestic magazine: an illustrated journal containing practical information, instruction and amusement', New Series Vol. VIII- IX, 1864. 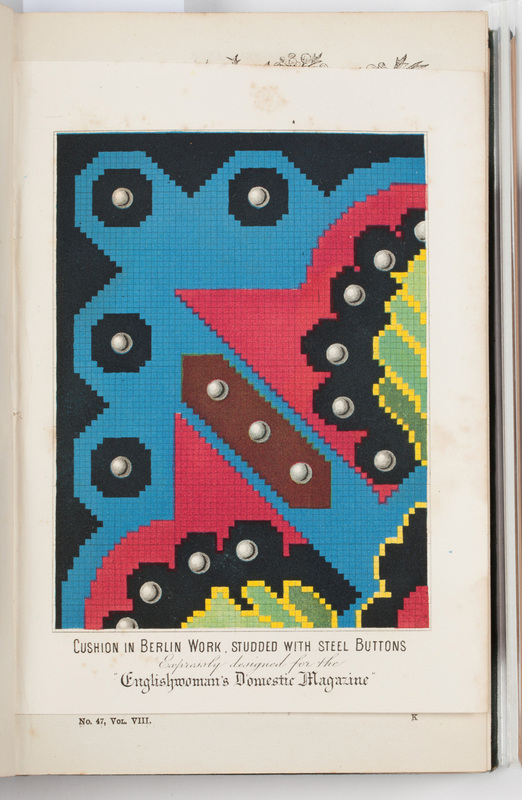 Needlework pattern in Berlin wool work for slippers from 'The Englishwoman's domestic magazine', Vol. 1 & 2, 1860-1861. Needlepoint tapestry is a style of embroidery thread-work on canvas. Works resemble the traditional hand-woven tapestries used for hangings, but being ‘one-sided’, are generally used for cushion covers and upholstery. A canvas is typically machine printed to create a charted design, which can then be hand embroidered using threads in corresponding colours. Tapestry chart by Anna Rosa Kita, Merrylands, NSW, 1950s, silk/rayon thread on cotton ground. Caroline Simpson Library & Research Collection, Sydney Living Museums. Box of artificial silk embroidery threads, Mark Foy's Ltd, c1910. Caroline Simpson Library & Research Collection, Sydney Living Museums. This tapestry chart (above left) was produced for Sydney department store Mark Foy’s Ltd. In the early 20th century most department stores carried needlecraft supplies and firms such as Mark Foy’s also retailed their own branded merchandise within the wider range. Anthony Hordern & Sons art needlework trade catalogue, 1911. Caroline Simpson Library & Research Collection, Sydney Living Museums. This item is fully digitised and available through Internet Archive.